A lot of bikers will spend hours waxing and polishing their bikes, but rarely if ever spend a minute caring for the gear that keeps them warm, dry and safe. Late last year, a customer wrote for some advice on looking after his boots; so here we are: a short guide to caring for your biking boots. The point that needs to be made is that motorcycle boots will often take a heck of a beating. We walk home in the rain in our best shoes, and we’re on them as soon as we get in the house to make sure they don’t get ruined. But ride home in four hours of pouring rain, and the boots merely get kicked off in the garage and left there. As commuters, we also often wear the same biking boots every day, all year round; yet any shoe dog will tell you that you should never wear the same leather shoes for two days running. The rigours of riding can take a toll on boots. 70 mile an hour winds, blazing sunshine, freezing cold temperatures, sleet, snow, heavy rain, puddles. They’re all going to dry the leather out. And you need to rectify that by feeding the leather to put back the essential oils that keep the leather supple, but which also make it naturally waterproof. After heavy rain, let your boots dry out naturally. A warm, well-aired room is great, but don’t put them on a radiator. That will makes things worse. Stuff the boots with newspaper if you can. The newspaper will absorb moisture, and help the boots keep their shape. Hang them upside down, so that the moisture can escape rather than seep into the sole. If the leather of your boots dries out too much, the natural water resistance of the leather will disappear. Looking after them will also, therefore, increase their ability to keep your feet dry. And as with a textile jacket, your boots also need to be re-proofed every now and again, especially if the leather has dried out. Now there are hundreds of shoe cleaning products out there. 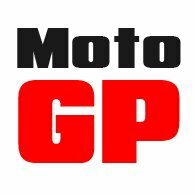 For my dress shoes, I use Safir creams and polishes from France, but the best products for motorcycle boots are made by Daytona, so whatever boots you wear, you can’t really go wrong with Daytona’s lotions and potions. Before you start cleaning your boots, get rid of any mud, dirt, grit and dust. You don’t want this in the leather when you work on the boots; you want the leather to be free of any impurities that might damage its breathability. Use a soft brush of some sort, or even a damp cloth to get the leather clean. 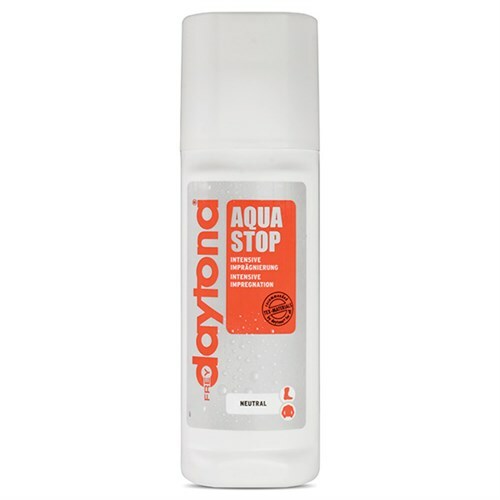 To re-proof your boots, we recommend you use Daytona’s Aqua Stop. Use a sponge to apply it, and then let the boots dry out. We don’t recommend a product like Dubbin, so beloved of our dads and grandads. It’s full of waxes and oils, and although it will make your boots waterproof, it will do so by blocking all the pores in the leather. Water might not get in, but the leather won’t breathe, and you’ll risk getting wet feet from the inside rather than from the rain. There might be a case for using something like Dubbin on an unlined boot, but there’s no point in paying good money for a boot with a waterproof membrane, if you then prevent the leather from breathing. A good membrane stops water from getting in, but allows moisture to escape. That can’t happen if the leather is heavily smeared in grease and oil. Once your boots are re-proofed, the leather needs to be fed with a good quality shoe cream, but again you don’t want a cream that is high in fatty oils. 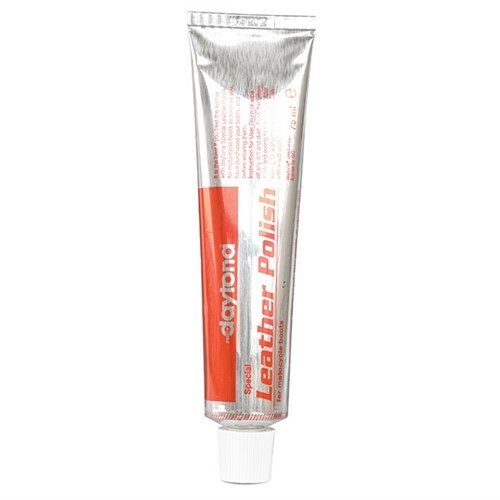 Daytona’s Leather Cream has been developed in conjunction with Gore-Tex, so it will nourish the leather without destroying the boots’ breathability. 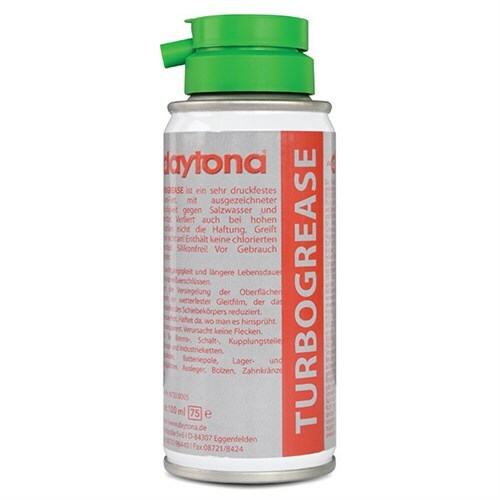 We’ve done a bit of research, and we cannot find another cream that has been designed to work specifically with a waterproof membrane, so Daytona’s cream seems to be the way to go. Once the boots have been re-proofed and fed, you can feed them with shoe cream. Daytona’s cream is called Leather Black. Again, it’s perfect because it’s not too oily. Use it sparingly; don’t go too heavy; firstly because it’s not necessary, second because it’s wasteful, and thirdly because, again, you want the leather to remain breathable. The Daytona cream only comes in black, so if you’ve got brown boots, apply any good quality shoe cream in the right shade but, again, only use a small amount. Once the cream has dried, you can buff the boots to a bit of a shine, but frankly we don’t see the benefit of using a wax polish on top of this. Nobody, surely, wants glossy motorcycle boots and, again, a wax finish, or glaçage, will do little for your boots’ breathability. If your boot has a zip, it’s also a good idea to lubricate the zip now and again. Grit and dirt can get into the zip and can cause damage. And it’s a shame to throw a pair of boots away purely because the zip has dried out, so a bit of zip grease can only help. Daytona has just the product for the job. As you might expect! If you’re riding in boots that don’t have a membrane, then you may feel justified in using other creams and waxes because breathability is not quite such an issue. But all leather likes to breathe, and leathers that have been tanned to be waterproof require a certain amount of oils and waxes to keep them functioning as they should. 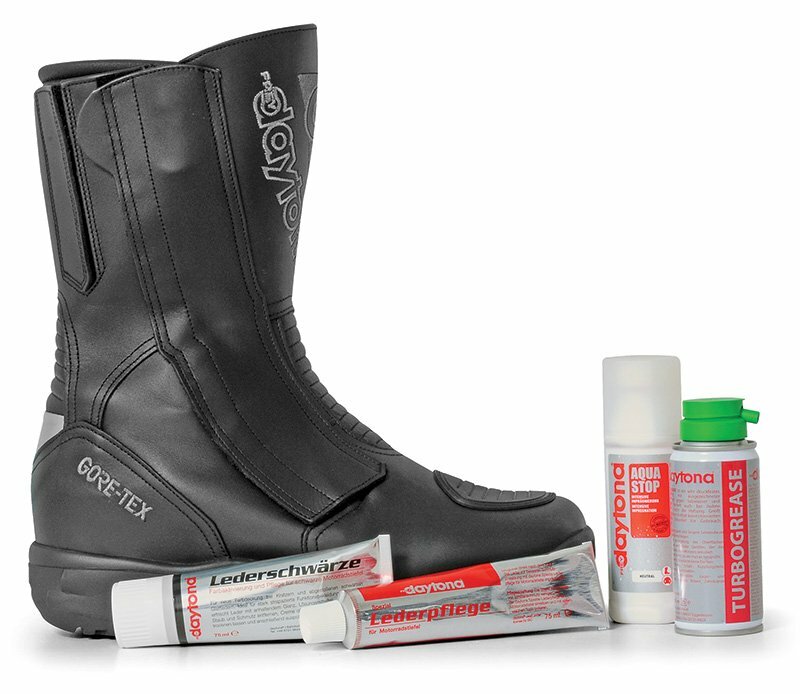 For boots that don’t have a membrane, you will do no better than Leder Gris Original from Altberg. 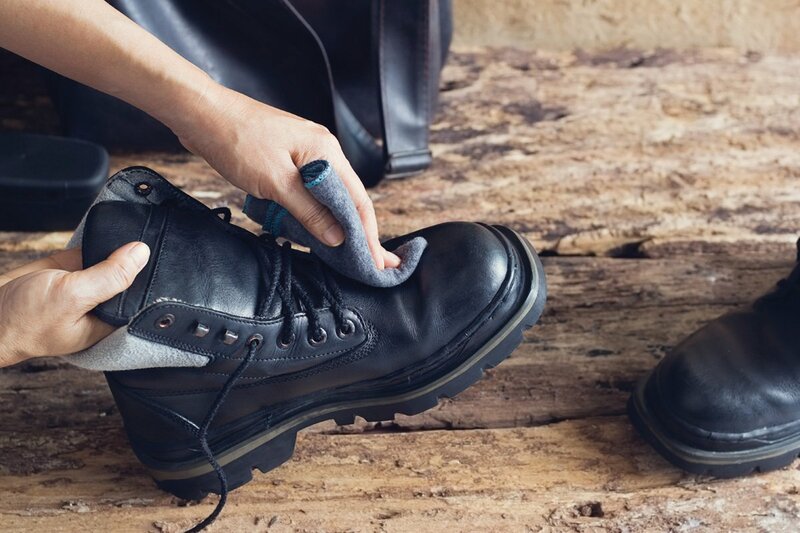 With so many types of leather, and so many different tanning methods, it’s difficult to ever be sure that you’re using exactly the right products for your particular boots. But of one thing we can be sure; treating your boots with creams, oils and waxes, even the wrong ones, is going to be better for your boots than doing nothing.